Does Incline Walking Improve Your Core? Whether you are outside on a hill or walking on an incline on your treadmill, you can effectively work your stomach by increasing your incline during your walk. Two types of abdominal fat exist — subcutaneous fat is the type of fat that is visible, while visceral fat is the dangerous fat that surrounds the organs. Incline walking blasts more calories than walking on flat ground. There is a greater demand placed on your body to walk uphill, which increases your heart rate and burns more calories. To lose 1 lb. of fat, you must burn 3,500 calories. 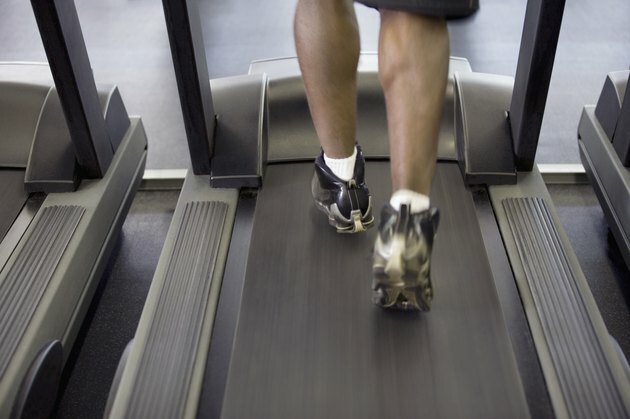 Walking on an incline melts fat from your entire body, including your stomach. CaloriesPerHour.com suggests that a 150-lb. person can burn 408 calories walking on an incline for 60 minutes at a 3.5 mph pace, while the same person only burns 259 calories walking on flat ground at the same pace. During an incline walk your abdominals are engaged to help stabilize your body. There are six major muscles of your stomach including the external obliques, internal obliques, transverse abdominis and rectus abdominus. As you walk uphill, your body must slightly lean forward to help propel yourself up your incline. More specifically, the hip flexors — the muscles at the bottom of the stomach that attach at the hip — are targeted. Each time your hip is flexed, when your knee comes up towards the body, the hip flexors are activated. Your transverse abdominis and recuts abdominis are activated to keep your core strong to help your upper body lean into your hill. Pumping your arms to help propel yourself uphill also activates both your internal and external obliques because of the slight torso twist performed with your arm swings. Incline walking is a weight-bearing exercise that helps you gain lean mass. The more lean mass you have on your body, the more efficiently you can burn calories, according to the American Council on Exercise. Having an increased lean mass means that you can burn more calories at rest by increasing your metabolism. The more calories you burn, the more unwanted fat you can banish from your belly to reveal a more toned midsection. Focus on walking for 60 minutes most days of the week to improve your overall health and alter your body composition. You can also add core work to your fitness routine to help develop strength in your abdominals. After your walk, choose three core exercises and complete three sets of 12 to 15 repetitions per exercise. For example, choose from situps, planks, bicycle twists, scissor kicks or reverse crunches. Does Walking Help You Get a Flat Stomach and a Tiny Waist? Does Walking Help Trim Down the Thighs? Does Walking Help With Stomach and Leg Tightening?